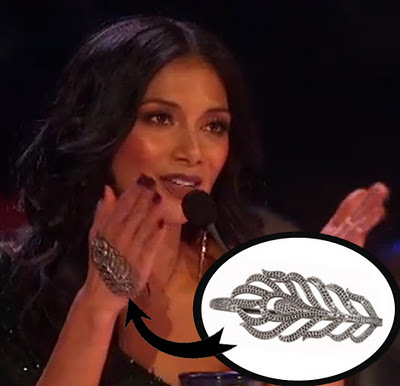 Thanks to Nicole Scherzinger on the X-Factor and Nicki Minaj's recent Va Va Voom music video, hand jewelry is back with a vengeance. Nicole wore a diamond leaf hand bracelet from Prive Jewelry while Nicki's piece was created by Marianna Harutunian in collaboration with Niki Schwan. The beautiful piece was designed to look like a lace glove with the rings all attached at the center. I am in love with Ms. Minaj's glove bracelet jewelry, totally ahead of the fashion game. If your a fashionista, this is one trend to watch out for. And a special shout-out to Dubai based brand Amato by Furne One since he designed several pieces for the singer in the Va Va Voom music video and he happened to include an Emirati burqa which is absolutely divine! Couldn't have imagined the day that Nicki Minaj would wear an sequenced Emirati burqa. Very hot!